It comes from your BFF – Gravity. Each week a piece of the puzzle was discovered about how to find and embrace your BFF in a lasting way. One of the elements of sitting deeply is, of course, balance. Yet, the question is - how do you balance on your horse? What is your reference point? What keeps you there? 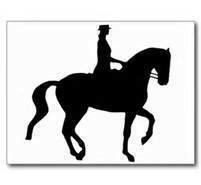 Often riders balance to the horse, but if the horse is crooked then the rider will crooked too and off-balance as a result. So what to do? What reference point to use? Allowing the soles of the feet to be oriented to the ground is the key. Sounds simple, but do you really know where the soles of your feet are? Notice where the soles of your feet are oriented in relationship to the room, a wall, the ceiling, a bit of both? As you bend your knees track the orientation of the soles of the feet in relationship to the room (you can do one at a time if you wish). Rest. Move your right heel in a small circle, notice the plane of movement that circle is in and how the movement changes the orientation of the sole of the foot to the room. Rest. Now make a circle with the big toe, notice the plane of movement that circle is in and how the movement changes the orientation of the sole of the foot to the room. Rest. Now notice the distance from the big toe to the heel, circle the heel, and notice if the big toe circles also, and if so, does it circle in the same direction as the heel or in the opposite direction? Notice how the movement changes the orientation of the sole of the foot to the room. Rest. Just for fun, as you circle the heel turn to look at it – what happens? Try it – it’s like a magic trick. Now do these movements with the left heel as your bring your awareness to how the sole of the foot is oriented to the room. When next on your horse, do these movements with your feet in and then out of the stirrups. Are your feet where you think they are? When allowed to orient to the ground what affect does this have on your balance and seat?